These are lyrics by New Found Glory that we think are kind of nonsensical. 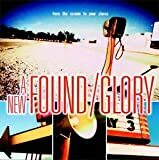 New Found Glory's, "Head On Collision"
How is it that one can be 'gone' and not know it? Pictures fade away, but memory's forever. Okay, where is this person going? Are they dying? If they are dying, why are people telling them it's okay? And how are memories forever? I thought pictures were forever and memories faded away? This doesn't make sense. And why is the song called 'Sonny'? Is that the real title? It's confusing...and dumb.